Bisti is a pine-cladded peninsula at the Eastern end of Ermioni, and at the same time, an open-air archaeological site. During the year, rock bathing and swimming is extremely enjoyable, especially in the clear blue waters on the Southern (Mandrakia) side of the peninsula. Snorkeling at the far tip of the peninsula will reveal many varieties of fish that swim in the crystal clear water. No matter what the season, the Bisti is an inviting place for swimmers, walkers and joggers all year round and at any time of the day. Whilst you are walking round on the Bisti footpath, you will not only see a renovated white windmill, but also remnants of the old Frankish and Venetian walls, foundations of the ancient temples, a warrior's tomb and fragments from purple shells which started Ermioni's economic development in the 5th Century BC. Throughout the whole ancient period, the Bisti was known as the Poseideon, with lavish temples, buildings and theatre built within its outer cyclopean stone fortifications. At the Limani entrance to the Bisti, there are ancient remnants of the temple of Poseidon next to the small church of Aghios Nikolaos. Further East, on the central flat hill of the Poseideon Bisti, one can see the stone foundations of the 5th Century BC temple of Athena, the goddess of wisdom, which later had a Christian Basilica built on the same foundations. Below the renovated white windmill (milos) facing the islands of Dokos and Hydra, is the ancient nobleman's tomb. Sadly, there is no trace left of the ancient theatre. It is said that during the Ottoman occupation, the theatre, the two temples and most sections of the Medieval walls surrounding the Bisti were dismantled, and the stone and marble transported over to Hydra for its construction. Today there are still ancient foundations of buildings along the Bisti-Mandrakia coastline, however, most of them are now found under the sea. Ancient Hermione, with the fortified Poseideon citadel built on the Bisti, used to be surrounded by 'Cyclopean' walls, the foundations of which are still visible today on the northern side of the Bisti, in addition to many places around the present town. In the same area of the Bisti lie the remnants of the workshops, where the deep red and purple coloured porphyra was produced for dyeing the cloaks of soldiers, nobles and kings, like Alexander the Great. By the windmill, there is an ancient nobleman's tomb, with the contents of the tomb displayed in the new Archaeological museum of the Peloponnese, in Nafplio. It is also likely that the warships of ancient Hermione, that were sent to support the Greeks in their war against Troy and against the Persian fleet at Salamis, set sail on their historic voyages from the Poseideon Bisti peninsula. During the Byzantine and Frankish Crusader era, Ermioni was re-named Kastri (castle). The new name was probably given due to the stone walls surrounding the Bisti citadel being enlarged, strenghened and fortified, using the original Mycenaean foundations. Some sections of these Medieval defensive walls can still be seen today, on the Northern Limani side of the Bisti peninsula in addition to sections throughout the old village and the new town. The enlarged fortifications extended beyond the original Western wall and encompassed the 9th Century Byzantine church of Taxiarches (Archangels) in addition to the new churches that had replaced the Classical temples on the Bisti peninsula and throughout the city during the Medieval period. Dokos is a small, 308m high rocky and barren island that is situated opposite Ermioni, on the Southern (Mandrakia) side of the Bisti. The island of Dokos lies between the Argolida mainland and the island of Hydra. Although a recent 2011 census showed as many as 18 inhabitants on the island, this figure seems to be made up from a few Orthodox monks, shepherds, fishermen and their families, but little is seen of them by casual visitors. In history, Dokos was occupied during the Mycenaean, Classical, Hellenistic, Byzantine, Frankish and Venetian periods. The ancient Greek name for Dokos was Aperopia. A famous early-Helladic ship wreck, around 2200 BC and the oldest in the world, was discovered here on 23rd August 1975 by Peter Throckmorton, and has been excavated just off its coast, near to the Byzantine castle. The fortified castle, which was extended by the Venetians, is situated on the hill of Kastelli, at the Eastern end of the island, and includes a number of buildings and a large Byzantine basilica, dating back to the the 7th Century AD. During the Greek War of Independence 1821-1832 against the Ottoman Empire, Skintos Bay on Dokos was used as a safe port by the Hellenic naval fleet of Hydra. Today, many private sailing yachts anchor at the North-Eastern Skintos Bay during the Summer months, as it offers shelter from all strong winds. 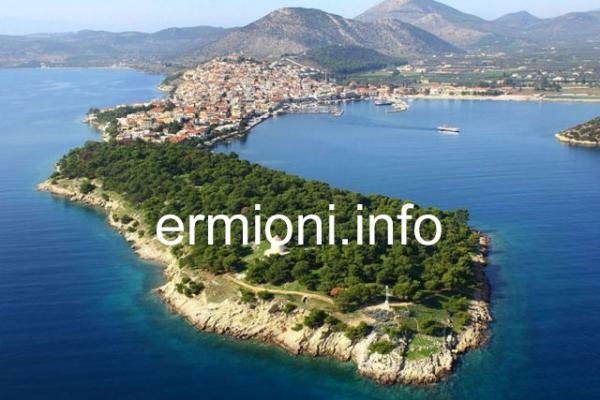 There are no excursions or tourist boats that visit the island from Ermioni. However, you might be able to persuade a local fisherman to take you across to Dokos, by private arrangement, but make sure you arrange for him to bring you back as well. Please note: There are no boat hire companies in the Ermionida area any more. You would have to contact and book directly with boat rental companies in Athens/Piraeus or Poros to charter motor yachts or sailing boats. Kapari is a small islet situated opposite Mandrakia and the Bisti peninsula. It gives its name to the whole of Kapari Bay which lies alongside Mandrakia, on the Southern side of Ermioni, round to the Monastery of Agioi Anargyroi and towards Kouverta. The islet is used by certain diving enthusiasts and some local residents for scuba diving as the waters are crystal clear and full of interesting marine life. Sadly, due to the retirement of Dimitris Kallianos, after operating for more than 20 years, the Kallianos International Diving Centre has now ceased to operate from this small islet.